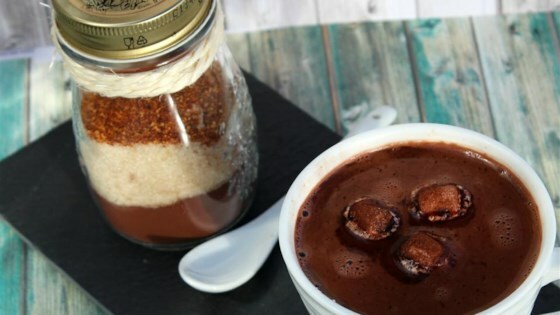 "Hot chocolate mix takes just seconds to make, and you may already have everything you need in the pantry. Just make sure one of those things is a very high quality cocoa powder." Place cocoa, sugar, salt, and cayenne in a bowl. Whisk until thoroughly combined. Store in glass jars. A high quality Dutch processed cocoa makes the best hot chocolate. To make hot chocolate, whisk in 2 tablespoons hot chocolate mix per cup of hot milk. Good ratios on the ingredients. Not too sweet nor too bitter, and easily adjustable if that is not the case for the end user. These make nice Valentine's gifts. Thank you for the recipe. We had some Hershey's cocoa and it was good, next time I'll try a higher quality Dutch Pressed cocoa as suggested. Very good flavor however as noted by others I added more sugar. I also added a bit more salt to it which brings out more sweetness. Dutch cocoa is a definite must for this.